Four in-line counters create an original and dynamic design for the Chrono 4 models. 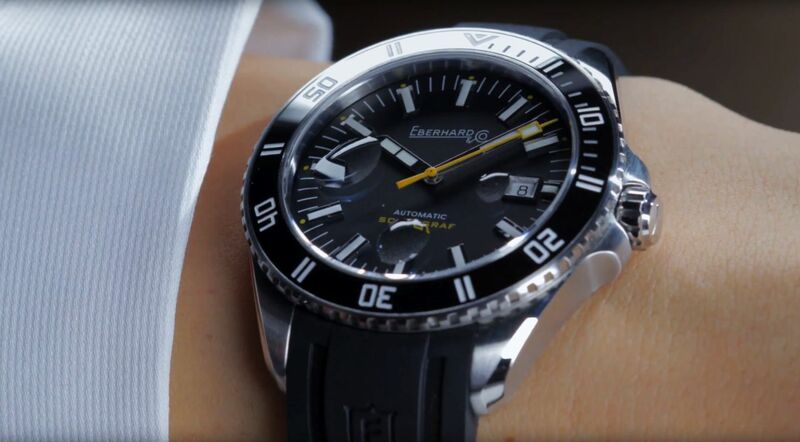 For almost 30 years, Eberhard & Co. has been synonymous with passion, innovation and attention to detail and design. These values have defined the Maison ever since it was founded. In 1919, it launched the first wrist chronograph watch, and then in 1938 the first chronograph to feature an hours counter, followed the next year by the first chronograph enabling double timing by means of a new “split-seconds” device. 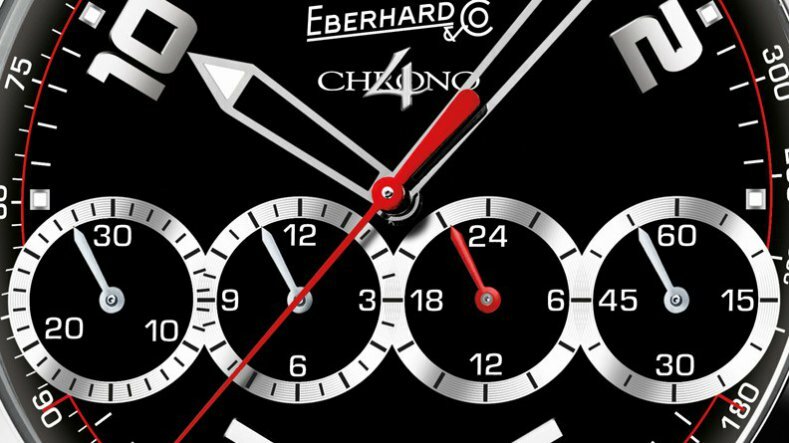 In the wake of the quartz crisis, Eberhard & Co. remained as passionately dedicated as ever to this watchmaking genre, since it was the first back on the market with a mechanical chronograph. During World War II, Eberhard & Co. with its Magini System watch, a split-second chronograph, was one of the two watch industry protagonists – along with Longines – contributing to a feat accomplished by the Italian air force: a secret flight from Rome to Tokyo and back achieved thanks to these two timepieces. During the latter half of the 20th century, Eberhard & Co. launched several chronograph collections including the famous Extra-Fort, Contograf and Tazio Nuvolari lines. 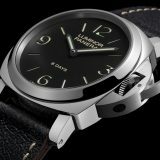 Eberhard & Co. kicked off the 21st century with another world-first, this time not on a technical level but rather in terms of design. 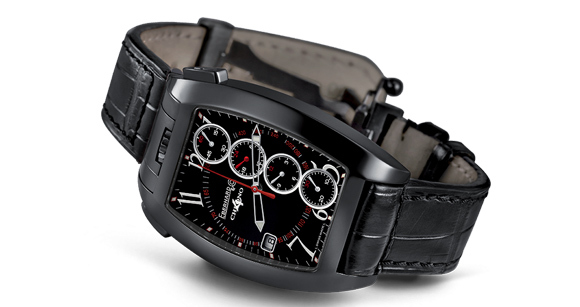 Released in 2001, the Chrono 4 pioneered a new dial counter layout. 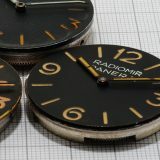 Instead of previous arrangements involving counters at 3, 6 and 9 o’clock, and sometimes a fourth at 12 o’clock, this model featured four horizontally aligned counters. This patented design echoes that of racing car dashboards and has become an unmistakable signature feature of the Eberhard & Co. brand. 30-minute and 12-hour chronograph counters, along with 24-hour and small seconds subdials, compose the line of four displays on the Chrono 4 model. Working on an ETA 2892 base calibre, the brand’s makers developed the Eberhard & Co. system that lends a particularly dynamic touch to the functions of this sporty timepiece, complemented by the date at 12 o’clock and a tachymetric scale. 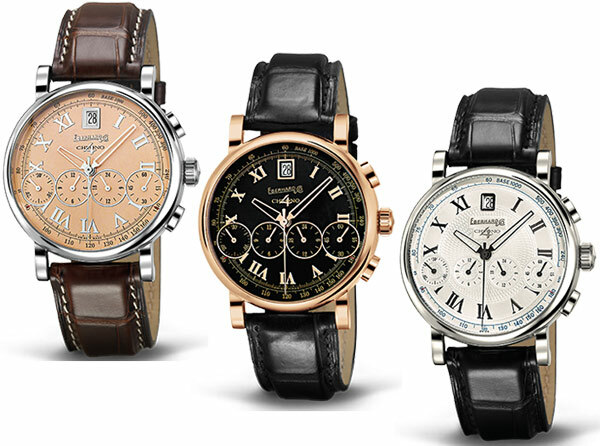 The Chrono 4 collection is interpreted in several sizes. 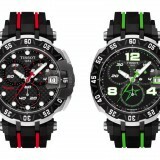 The original 40mm model was enlarged to “Grande Taille” (43mm) and “Géant” versions respectively introduced in 2008 and 2010. 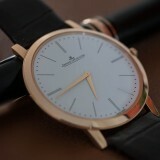 While most of them have a steel case that underscores their sporting style, the 40mm models also come in pink gold. 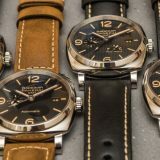 They feature a white, black or blue dial with tone-on-tone or contrasting counters and subdials, along with raised rims, luminescent hour-markers, dagger-shaped hands and a choice between a steel bracelet and a leather or rubber strap. 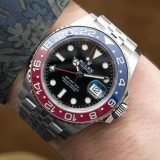 The Grande Taille steel models with a rubber strap are distinguished by rubber inserts on the screw-lock crowns and several versions are enlivened with colourful accents (counter hands, hour-markers, the tips of the hours and minutes hands), while a limited edition commemorating the 10th birthday of the collection is recognisable by its large red Roman X numeral. The “Géant” versions stand out with their sturdy 46mm steel or titanium case, water-resistant to 200m and topped by a unidirectional rotating bezel. 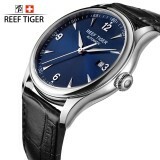 Last but not least, the line is topped in fierce style by a “Full Injection” limited edition: a dark carbon-coated steel colossus with an ultra-dynamic rubber strap, while nonetheless flaunting the elegance of a dial adorned with a C?tes de Genève motif. After inventing in-line counters, Eberhard & Co. came up with the idea of pivoting its counters to appear in a vertical line – and this time in a tonneau-shaped rather than a round case. 2005 thus witnessed the emergence of the surprising Chrono 4 Temerario with its counters arranged in a column on the right-hand side of the dial. This model also featured a patented access system to the crown, which opens by a lever hidden on the back of the case at 12 o’clock. 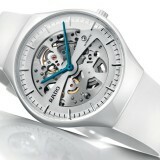 The Chrono 4 collection is also enriched with Bellissimo creations that certainly live up to their name. These less sporty-looking models come with a slimmer 40mm case and more discreet pushpieces. The traditional white, black or blue dials are joined by an innovative new apricot shade that gives a distinctively vintage look to that particular variation, and all are graced with applied rhodiumed Roman numerals and cut-out hands. For the first time in the Chrono 4 collection, the Belissimo Vitré interpretations are fitted with a sapphire crystal caseback revealing the self-winding calibre. 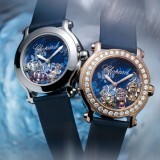 And finally, the luxurious Coeur Vitré version boasts a movement adorned with sophisticated hand-crafted decorations. 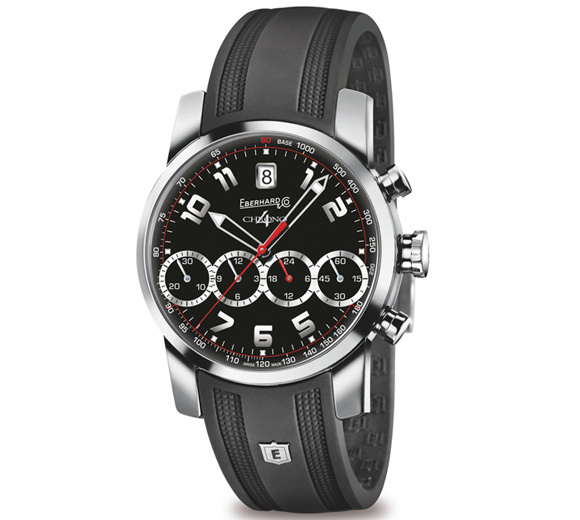 The Eberhard & Co Chrono 4 Badboy watch incorporates the brand’s specially patented device that revolutionized the time-reading, having united four counters positioned in line on the watch’s face – for minutes, hours, 24 hours and small seconds.The heart of the powerful Eberhard & Co watch is a mechanical chronograph with automatic winding movement. 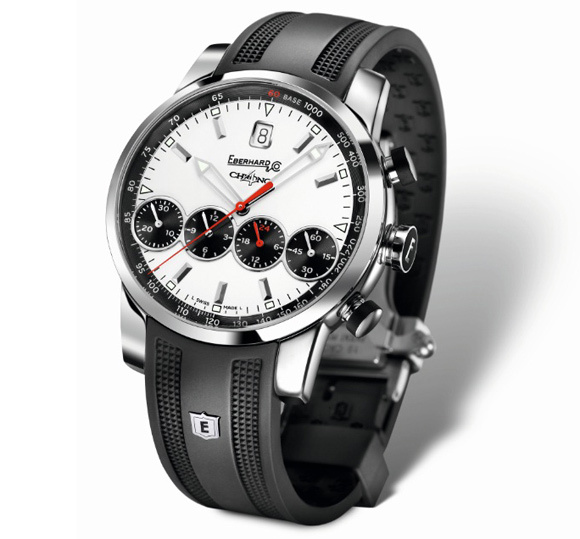 The Eberhard & Co Chrono 4 Badboy watch is coupled with an attractive black rubber strap that is vertically sculpted.